Let’s face it: going to your stylist for color touch-ups every four weeks doesn’t always fit into our budgets or our busy schedules. What to do when your roots are showing and you want to look polished for a photo or a special event? Fortunately, there is a solution. Top brands have created hair root concealers for a temporary but absolutely 100% effective solution to save us from color mishaps and unwanted root regrowth. Choose from sprays, powders, sticks, and creams that come in a variety of different shades to match all hair colors. We’ve rounded up the best touch up products to hide root regrowth and keep your hair looking fresh between color appointments! L’Oreal Paris Magic Root Cover Up works great on all hair types and textures, lasts until your next shampoo, and doesn’t leave any residue or stickiness. This product is one of the most affordable on this list, which makes it worth trying. With L’Oreal’s popularity, you can easily find some YouTube reviews to get a closer look at this product. Some people say that effect doesn’t look natural, but this product can work well with the right shade and application process. L’Oreal’s root concealer packaging looks nice, but gives off an overall neutral first impression. Delicate issues like covering grays and root regrowth can be difficult to approach from a mass marketing perspective, and may create skepticism in the product. However, we recommend trying each product without prejudice. Dry hair before applying for best results. Shake the bottle and spray about 6 inches away from hair. Comb through and let the product dry. The drying time depends on how much product is applied. The more you spray, the longer it will take to dry, from 3 to 10 minutes. Like other sprays, this one is slightly messy, so it’s better to wear an old T-shirt when applying for the first time. YouTube beauty gurus recommend using napkins as stencils for more precise and neat application to hairline and temple areas. Wearing disposable gloves also saves clean-up time. To help you choose the perfect shade, use L’Oreal’s original color palette on their Amazon page or watch a couple of YouTube tutorials to find the most natural-looking option for your hair. L’Oreal’s Magic Root Cover-Up is an affordable product to hide grays and root regrowth. Success with this product takes practise; watch tutorials, wear an old tee, and start experimenting. In order to avoid an unnatural effect, don’t spray too much product too close to the head, and comb it through your locks when completely dry to blend it in. Take your time and you’ll get it right. Style Edit Root Concealer promises to instantly cover grays and root regrowth between salon visits. The 2-ounce bottle is reasonably priced under $20 and fans of the product say it lives up to its claims. The spray doesn’t leave a greasy or stiff residue and stays put between washings, even during hot, humid days or sweaty workouts. If you’re not a fan of sprays, Style Edit also offers a lightweight, binding powder. The bottle design is pretty neutral, casual but stylish. Style Edit’s special pin-point applicator promises professional and neat spot application and the product has a great scent. For best results, dry and style your hair as usual. Shake the bottle and spray 2 to 3 inches away from your part, hairline, or temple areas until your roots are evenly covered. Repeat as necessary. Remember: less is more when it comes to this product. Holding the nozzle too close to your head during application can result in a spray-painted look. Sometimes this touch-up spray can leave a sticky feeling similar to firm-hold hairspray, but this is avoidable by applying lightly and evenly. Also, try blending the color through your hair with brush after drying. This product is good for thinning hair and bald areas — but be careful when choosing a shade to avoid unnatural-looking colors. Watch some reviews or tutorials for tips on choosing your perfect shade. However, Style Edit’s color adaptive pigments can self-adjust to match any hair color. Style Edit Root Concealer is a reliable temporary solution between color appointments. This product lasts much longer (6.4 ounces per bottle) than other sprays, so you can buy a bottle without worrying about it quickly running out. We also liked that Style Edit’s spray makes hair look much thicker and polished. It’s a great way to look fresh for that special event without running to your colorist. Oribe Airbrush Root Touch-Up Spray isn’t the least expensive root concealer on the market, but there’s a reason the brand’s devoted fans keep coming back. Oribe’s spray promises to instantly cover grays and roots, revive highlights, and absorb dirt and oil to refresh your hair like a dry shampoo. A special UV absorbing ingredient prevents further color degradation by strengthening hair fibers. However, fans swear by the spray’s ability to cover dark roots on blonde hair. Oribe is synonymous with great design. The product has a delicious smell and there are plenty of other reasons to fall in love with it. The bottle looks small but it’s comfortable to hold. Question is: is it powerful enough to cover stubborn grays or pesky roots? For best results, spray on dry hair. Spray from one bottle’s length away along grays or root regrowth and let dry for 1 to 2 minutes. Use it only on your part line and hairline. It’s not supposed to be sprayed all over your head. If you’re not satisfied with coverage, lightly spray again. Put this travel-friendly little bottle in your bag to touch-up coverage on-the-go. This workout-proof product won’t run when you sweat, and acts like a dry shampoo with a cleansing and volumizing effect. However, the color can bleed onto your hands or pillowcase and the tiny bottle doesn’t last long. black (for natural hair and really jet-black colors). If you’re not sure which shade will match your color, product reviews can help you choose. However, Oribe makes color-matching a breeze with its smart-powder that can actually adapt to your color. Magic? Chemistry! Oribe Airbrush Root Touch-Up Spray is a little pricey and the bottle doesn’t last long, but it is a good investment. If you want to be more economical with this product, use it only for special occasions. Rita Hazan’s Root Concealer Touch-Up Spray promises an instant fix for roots between colorings. The waterproof, transfer-proof root concealer spray was developed by New York City colorist, Rita Hazan, who is known for her salon, Eponymous, and creating iconic looks for Katy Perry, Jessica Simpson, Jennifer Lopez and Beyoncé. So, does this ammonia and peroxide-free root concealer live up to the hype? This root concealer has super-cute packaging, but the bottle size is surprisingly small as for the price. Hopefully, this means that it is economical. Rita Hazan likes to emphasize the travel-friendliness of this spray and her marketers must know what customers need. The smell is a little strange, though it’s not too noticeable. The best way to use this product is to spray it on dry, styled hair, but you can always experiment and find your own process. Shake well and spray 6 to 12 inches away from your roots. This distance is uncomfortable for precise spot application, but if you apply it too closely, the coverage will look unnatural and the product takes longer to dry. Rita Hazan does offer a special touch-up stick for precise application, but it’s very expensive at over $60. You will find more affordable options for spot application in this article. The spray is a little messy during application, so you might want to wear an old t-shirt to avoid staining your clothes. For best results, let the spray dry completely before brushing or styling. red (for ginger, auburn, copper and other red shades). This product really helps you extend your color between salon appointments. The quality of Rita Hazan’s Touch-Up Spray is excellent, but you have to practice applying it. The small bottle may travel well, but the application process requires an old T-shirt, good lighting, and wet napkins for cleanup. Not travel-friendly at all. However, if you take your time and apply it correctly, you will love this product. Bottom line: the quality of Rita Hazan’s root concealer is one of the best on the market, and you can also create amazing highlight effects by using different shades. Ever Pro’s Gray Away Temporary Root Concealer is a decent, hard-working touch-up product for those trying to cover grays. The spray promises to save you time and money at the salon with instant, temporary, full-coverage color. Fans of this product love the full-coverage, anti-clumping texture, the easy application and natural color blending effect. This root concealer is free of parabens, peroxide, ammonia and other harsh chemicals, so it’s completely safe for daily use and for all hair types. The packaging is direct and shows the consumer the results they can expect from the product. This brand knows how to get your attention with marketing. Ever Pro’s pin-point applicator design is much more comfortable than other available options. Dry and style your hair as usual. Shake the bottle and spray from about 4 to 6 inches away from your hairline, keeping hair flat with the help of your free hand. To avoid stains and overspray, use some wet napkins to clean the excess from your forehead and partline. Like most sprays, Ever Pro Gray Away can be messy, so don’t wear your favorite top during application, especially on your first try. Watch this helpful video tutorial for some tips and tricks to effective application. Ever Pro offers another affordable option. Try their Gray Away Touch-Up Powder if you would like a more precise application method. You may not be able to find the perfect match, though Ever Pro promises that their self-adjusting color technology will match most colors. However, this product is not suitable for platinum or very light blonde hair. Ever Pro Gray Away Temporary Root Concealer can be messy, but with practise, you’ll be applying it like a pro in no time. This product feels great in your hair, and you can forget about grays completely — until your next shampoo. As one of the most experienced celebrity hairstylists, John Frieda knows the struggle is real when you don’t feel like rocking grown out roots. His solution to hiding grays and roots includes revolutionary color blending. John Frieda’s Root Blur Colour Blending Concealer palette, a professional and life-changing root cover-up product, can help achieve a flawless, blended effect. This root concealer has attractive and convenient packaging, making it ready to travel at a moment’s notice. The black, minimalistic, luxurious compact contains two shades of powder, a dual-ended brush, and a mirror. The powder area is quite small, but compared to spray concealers, this seems like enough product to last for a while. This powder has a neutral smell and feels like eyeshadow. Some reviewers have mentioned that the brush is small, however, it seems perfect for more precise application. Start with dry, styled hair. Start by applying the darker shade to your roots. Apply the lighter shade to add dimension and achieve a natural look. Application is very easy and intuitive and the powder stays where you put it. The shades work with each other to give you a natural-looking solution when you can’t get to the salon. This product can cover your grown-out roots, camouflage grays, hide dark roots on blonde hair, extend highlights, and even add thickness to your mane. Chestnut + espresso (for medium and dark brunettes). Customize your color using two shades from each palette to create the most natural look. You can perfectly blend roots away with this Root Concealer. However, if you have large areas to cover, you may want to invest in a touch-up spray instead. The small brush is designed for more precise application. Keeping pastel locks free from visible roots has never been easy, but we have found the secret to keeping them fresh for weeks after your last visit to the salon. Most root concealers only come in natural shades, but Rootflage is a temporary root touch-up powder that comes in 25 stunning colors. 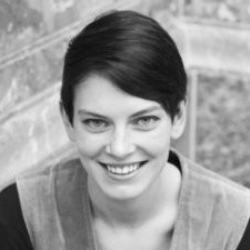 Rootflage was started by Lucy Williamson O’Quinn, a Southern California native who loved experimenting with her hair color but was tired of the expensive salon visits. Her root touch-up powders are paraben, gluten, synthetic fragrance, and phthalate-free so your hair will feel as good as it looks. Rootflage Touch-up Hair Powder packaging is bright and comes with a big brush for overall application and a smaller brush for more precise application. We were immediately drawn to the visual and tactile components of this product. It’s comfortable to use everyday and small enough to take with you when travelling. Dab on roots while the powder comes through the hole in the center of the brush. Unscrew lid and dip corner of a brush into powder and apply. This is a great way to extend highlights or if you have big area to cover. Unscrew lid and do the same with the smaller brush for more precise application on hairline and temple areas. All these tips work great, though if you’re on-the-go, the first one is the easiest and quickest application. Rootflage comes in natural shades and are available for blondes (light blonde, cool blonde, warm blonde, strawberry blonde, bright copper), brunettes (dark copper, light brown, golden brown, medium brown, dark brown, black brown) and redheads (merlot, crimson red, agent orange). It’s also available in vibrant unicorn colors like green dragon, cotton candy pink, three shades of blue, a lovely lavender, titanium, and purple. With 25 shades to choose from and its lightweight texture, Rootflage is a major contender. It not only covers grays and root regrowth for all kinds of colors, it is powerful enough to hide black roots on blonde hair. If you’re not a fan of messy sprays, a powder root concealer may be the best solution. COLOR WOW Root Cover Up comes in a compact with a brush and promises to camouflage your roots without being sticky or oily. Fans of this root touch-up powder praise the product’s effectiveness at covering dark roots and grays and they love the lightweight feel. Critics say the product can get on your fingers and nails during application, and that the application is much more time-consuming than sprays. This product is well thought-out. The packaging is convenient with a mirror inside and a brush with dual tips in different sizes for precise application. The COLOR WOW’s portable compact looks and feels like all luxury beauty brands — stylish with quality construction. Top hair stylists recommend COLOR WOW Root Cover Up for covering grays, root regrowth, and to extend the life of your highlights. To apply, open compact, sweep the small end of applicator brush over concealer to load it with powder. Use your free hand to hold hair tight and flat. Then apply product on roots you want to cover or highlights you want to extend. Use a dabbing motion instead of a brushing motion. Be sure to have a lot of product on your brush and generously dab it into your roots. Use the bigger brush to dust off excess powder. Watch this YouTube tutorial for a look at the process. Application of this product is easy, intuitive, and fast. Unlike a spray concealer, there’s no risk of staining your clothes with wayward droplets. All shades look natural and are easy to match your color, so you can choose a shade without second-guessing. This is a great temporary solution for covering root regrowth and extending highlights like a pro. The COLOR WOW product might be perfect for those with a smaller area to cover since the brush is designed for more precise application. The coverage is water- and workout-proof, so you don’t have to cancel yoga class or stay home when it’s raining. This product offers something that sprays can’t: precise control during the application. 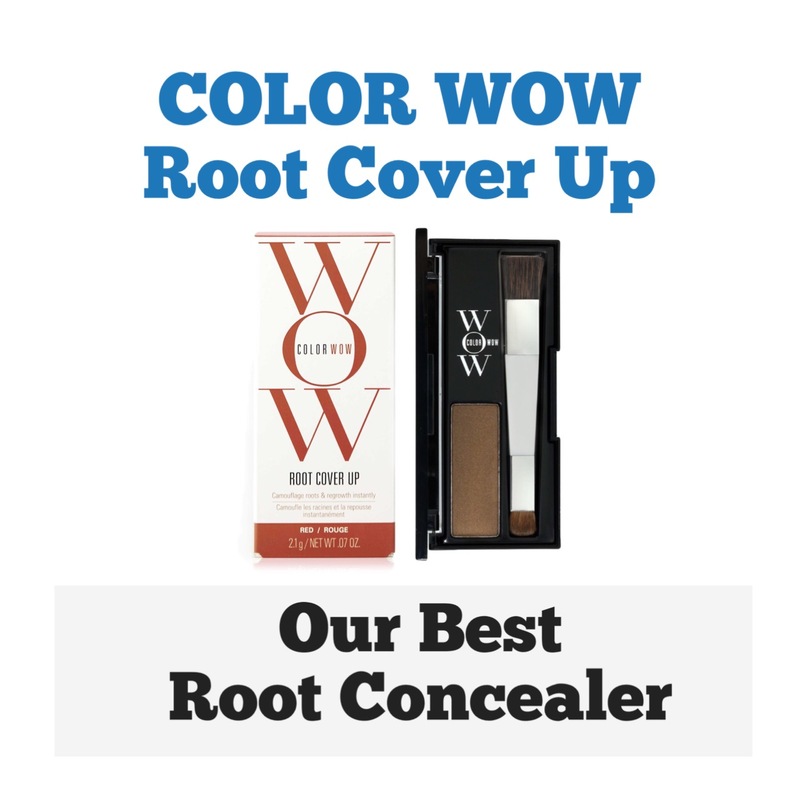 If you’ve ever used a root concealer spray and felt disappointed with the results, give COLOR WOW Root Cover Up a chance. This is the best root touch up powder! The FAQ below can help you choose the perfect touch-up product for your needs. Do Touch-Up Products Cover Gray Hair? Yes, they do. Check out our article dedicated to root concealer options for older women and read all the pros and cons of each touch-up method. How Long Does a Root Concealer Last When Applied? All contemporary root touch-up products will stay in your hair until the next wash. Some of them may be not waterproof, but the root concealers reviewed above are workout-proof and won’t “run” if you sweat. How Long Do Root Concealer Sprays Take to Dry? The average is between 3 to 15 minutes, depending on the amount of product you apply. Can Root Concealer Have Additional Benefits? Yes, some touch-up sprays may add volume, some may make hair visually thicker, some have a nice scent, and some have a dry shampoo effect. Can Root Concealer Cover Dark Roots on Blond Hair? Yes, but you need to find the perfect shade and apply enough product to cover it. It would seem counter-intuitive, but by using a slightly darker shade, you can create a more natural look. Can Root Concealers Damage Your Hair? No, they’re absolutely safe for your hair. Remember to choose products from reliable brands and read ingredient lists if you have sensitivities. Can I Apply Touch-Up Products to Wet Hair? Best results are achieved when applied to dry, styled hair. At the end of the day, is root concealer worth it? In our book, the answer is absolutely! Once you find the best root concealer for your hair texture and color, visible roots will become a thing of the past. Though some root concealers are pricier than others, they’ll save you money and time you would’ve spent at the salon. Whether you’re keeping those stray grays at bay or convincing everyone you were born a natural blonde, there’s a perfect root touch-up product for you.